80% of all data created, replicated, and transmitted today is unstructured, however not all storage systems are designed to handle such volume. If you think you’re falling behind, it might be time to consider moving to the cloud. 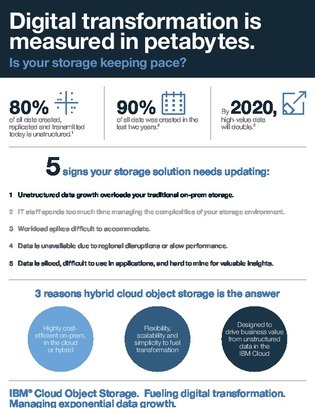 In this infographic learn 5 signs your storage solution may need updating, 3 ways hybrid cloud object storage can help, and more. Access now to revamp your storage infrastructure to fuel your digital transition.